Description: BNSF stack train streaks into the yard from the north with a Dash 9 at point, helped by a Heritage I slug and Dash 9. 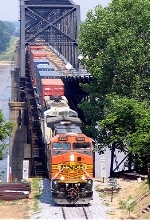 Description: An eb is about to swing back onto BNSF tracks from the NS joint line as a wb grain sails by. Description: Hooray for the CSX unit! Description: A hot intermodal train passes Q380-01 headed east at MP 14.5 on the CSX Shortline. Description: Burlington Northern Santa Fé # 5449 northbound on Union Pacific track # 2 passing the Lehigh Southwest Cement Company. Description: Some BNSF Railway light power heads West along the IHB at Dolton crossing. Description: BNSF 5449 leading a double stack train through Kingman Canyon near Kingman, AZ with 3 other dash 9's, the second unit is an NS CW40-9 which is a long way from home.